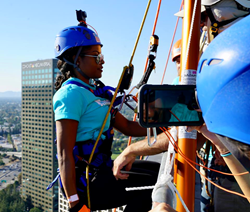 Keesha Sharp, star of “Lethal Weapon” was one of the many supporters who raised money by rappelling. Money raised at “Over the Edge for Veterans” will be used to complete the remaining 7 homes of the 78-home Veteran Enriched Neighborhood® in Santa Clarita. The Veteran Enriched Neighborhood® model includes services such as financial literacy workshops and veteran-specific trauma-informed services. Money raised at “Over the Edge for Veterans” will be used to complete the remaining 7 homes of the 78-home Veteran Enriched Neighborhood® in Santa Clarita. The Veteran Enriched Neighborhood® model provides more than just a home – it includes services such as financial literacy workshops and veteran-specific trauma informed services. This model has shown measurable outcomes in the neighborhoods built by Homes 4 Families for more than decade. Sean Maguire, Once Upon a Time, Alison Haislip, BattleBots, and Natacha Karam, The Brave served as announcers for the event which launched with an LAPD SWAT helicopter flyover and members of the SWAT Team setting the tone by being the first to rappel down 25 stories. Veterans rappelled as well to help raise money to build their homes, and the homes of their brothers and sisters in service. The evening cocktail reception was hosted by Karam; Live entertainment was provided by Oscar-nominated actress Marianne Jean-Baptiste (Blindspot) who sang with the music ensemble Ian Roller and Friends. Duct Testers, Air King, Industrial Metal Supply Company. Reception Sponsors were Rosenheim & Associates, Inc. and Planning Associates Inc. Lunch Sponsor was Pacific Coast Civil. Breakfast Sponsor was Jeff & Karen Brown. Premium Hire a Hero Sponsor was WFG National Title Company. Hire a Hero Sponsors included Cinmark, Premier America, LAPD SWAT, Logix, Poms & Associates, Fallbrook Capital, Coast to Coast Computer Products, The Green Shield, Anheuser-Busch, Westfield, and Stater Bros. Charities. Media Sponsor was Calabasas Style. Additional Sponsors included Next Architecture, Legacy Construction and Development, Aflac, HR Highridge, Variel Court, Brad Rosenheim, Eric Steinhauer, and Somerset Group. The rappelling aspects of the event were produced by Over the Edge, a special events company that provides signature events for non-profit organizations anywhere in the world. Participants are invited to raise pledges in exchange for the once-in-a-lifetime experience of rappelling over the edge of a prominent building. Homes 4 Families (http://www.homes4families.org) empowers low-income veterans and their families to enter the middle class through affordable, full-equity homeownership combined with holistic services that build resiliency, self-sufficiency and economic growth. Through its outcome-proven Enriched Neighborhood® model, the nonprofit provides service members, veterans, and their families with comprehensive wraparound services that equip them to succeed in civilian life, including financial education, therapeutic workshops, trauma-informed programs and veteran-to-veteran support. With more than ten years of research-backed experience and success, Homes 4 Families works closely with the California Department of Veterans Affairs and others to build permanent, thriving veteran communities.